Following a Eucharistic Conference called ‘Adoratio’ hosted at the shrine of St. Mary Magdalene, in Saint-Maximin-la-Sainte-Baume, in France in July 2014, Antoinette was inspired to complete a 7 Day silent retreat in the US, with the Missionaries of the Most Holy Eucharist. During this retreat, Antoinette was instructed by her Spiritual Director Fr. David to contemplate more on Scripture. Fr. David recognised from the way that Antoinette meditated and visualised scenes from scripture that, she had received a gift from God to help facilitate those seeking to meditate and come closer to the Word of God, especially those directly involved in Children of the Eucharist (COTE). Children love stories and are very visual also so, Antoinette hoped she could bring the living Word of God to them and help them enter into the scripture passage that, they were meditating on, in the COTE programme. During this retreat, Antoinette received in prayer that, if we meditate on the Word in front of the Word, we will receive many graces. She shared this with Fr. David. Antoinette realised in that moment the importance of not only feeding of the Eucharist but, to be nourished by the Word of God also. Antoinette returned home to Ireland and started a scripture prayer group, on the Eve of the Feast of St. Mary Magdalene after praying a 9 day to the great saint. In September 2015, Antoinette felt a strong pull to return to the shrine of St. Mary Magdalene and spent 4 days in silence and prayer. She was truly inspired by the love and adoration St. Mary Magdalene had for the Lord and felt she shared this same devotion. So much so, Antoinette named the scripture group after her. 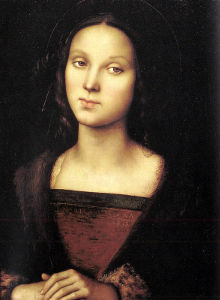 Antoinette recommends Luke 7:36-50, as a great passage to reflect on Confession, St. Mary Magdalene being the perfect penitent – in this passage, we see the true love of Christ for all sinners. If we pour out our tears (of worry, anxiety or fear) on the feet of Jesus, He will embrace us with His merciful love. Word spread quickly about the ‘St. Mary Magdalene Scripture Group’ and before long 5 other groups of COTE volunteers started up, around the country. From the testimonies below, you can see how much scripture has impacted the prayer lives of the leaders. This is another wonderful fruit of COTE.